Rapid Set No-Mix Concrete is a proportioned blend of dry aggregate, graded sands, cement and additive mixture suitable for post hole applications where lower than normal strength is acceptable. Rapid Set No-Mix Concrete CANNOT be mixed in a wheelbarrow or mechanical mixer like normal concretes. Ideal for setting fence posts, logs, clothes hoists, letterboxes or for any application requiring the fast setting of some support pole structure. Calculate the volume of the hole in cubic metres (using V = πr²h) and then subtract the volume of your post. This will give you the volume of concrete required. Simply multiply the volume figure by 108 (108 bags per cubic metre) to give the amount of 20kg bags needed to fill the void. Not recommended for use with aluminium substrates as corrosion can occur. Please consult aluminium manufacturer prior to such use. No mixing required. Simply pour in approximately 1.5 litre of clean water in the hole. Add half the contents of the bag and then tamp with a steel rod to entrain the water into the mix. Empty the remaining half of the bag contents and add a further 0.5 litre of water. Tamp again and finally compact the surface. Ensure posts/logs are braced for at least 15 minutes to allow mix to set. For best results keep Rapid Set No-Mix Concrete moist for 7 days by light watering to help maximise final compressive strength. 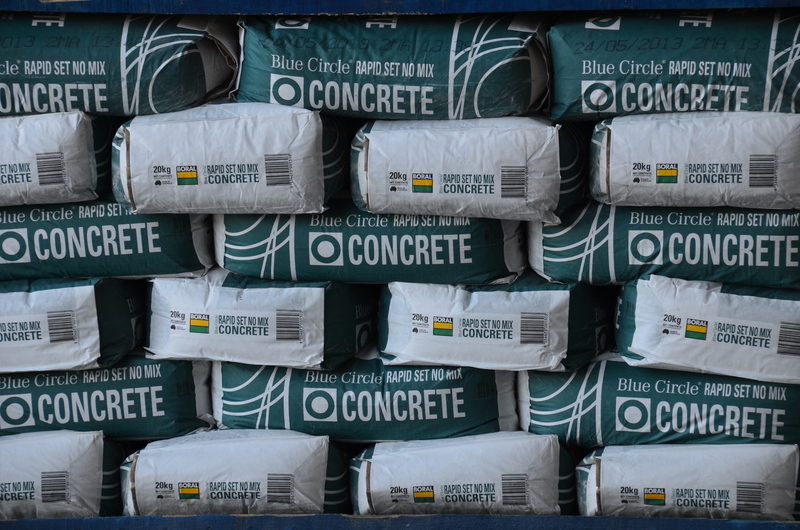 Blue Circle® Rapid Set No-Mix Concrete comes in 20kg plastic lined, multi-walled paper sacks. One 20kg bag will yield a volume of approximately 0.011 cubic metres. Or 108 x 20kg bags to one cubic metre.